Have we seen the best of Top Gear ? Top Gear line up: Jeremy Clarkson, Richard Hammond and James May. I will always openly admit that my favourite programme on television is Top Gear. The mix of laughter, cars and genuine passion and interest for what the three presenters do is what appeals to me most. 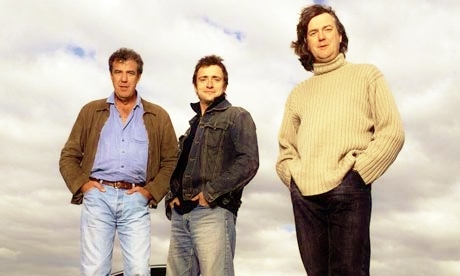 Hosted by Jeremy Clarkson, Richard Hammond and James May, “New Top Gear”, as they call it, began in October 2002. Ten years on, Top Gear remains the most watched car programme in the world with over 300 million viewers and remains one of the, if not the, most successful and most watched show on British television. But in recent years, the numbers of shows per series has decreased dramatically, and the content of the show has moved away from the original ethos of Top Gear. So have we really seen the best of Top Gear? When considering what to write in this blog, I originally thought it would be a simple answer of yes, however, the latest series of the programme, broadcast in early 2013, has shown how the quality of the show remains one of the highest on British TV. Stunning camera shots, specialist filming of high performance vehicles and interesting yet quirky items have seen Top Gear deliver highly on their changed priorities – more expensive and powerful cars are reviewed over ‘sensible’ cars for the average motorist. The early editions of the new format of Top Gear did reflect some of the content of the old format. Informative and factual reviews of cars such as the Citreon Berlingo and Land Rover Discovery made the car reviews, whilst the new interests of the modern viewer wanted excitement and power. This came in the form of more focus on power cars such as the Lamborghini Murcielago and Pagani Zonda. The new format is studio based, unlike the previous, and features new additions such as lap times with The Stig, and a new interview feature – A Star in a Reasonably Priced Car. These segments revived Top Gear from what was a struggling motoring programme into a show that boasts immense commercial success. It was around series 4 when Top Gear moved to film new and exciting challenges such as the legendary Aston Martin versus a train to Monte Carlo and the cars playing football – a feature which still recurs today. In the latest series’ of Top Gear, there has been a shift from the review of sensible, everyday cars, to longer films about supercars and the challenges the presenters face from the producers. This is not necessarily a bad thing. I always defend the programme when people claim ‘they don’t do normal cars’. That’s not because they’re not interested in them. The audience has changed. Younger viewers want excitement and high-octane thrills. An insight into the power of a Ferrari is likely to be preferred over reviews of a bog standard Vauxhall. In 2007, Top Gear moved into another new era, as some of the one hour programmes became dedicated to one single challenge. These often consist of buying a certain type of car for less than a given budget and then driving them through rough terrain, encountering a number of difficulties. The rapport of the presenters, the character of the cars chosen and the obscene challenges faced are what have and continue to bring in the millions of viewers who tune in on a Sunday night. I can’t, however, feel comfortable that Top Gear will go from strength to strength. The legendary films that Top Gear has produced – the trip to the North Pole, the American special and Bugatti Veyron race across Europe are items that viewers will not forget and that brings a very high standard to future productions. It’s simple – some but not all of the films following such stand out years for Top Gear have not been matched. At points, there is some question about the spontaneity of events. The caravan holiday antics where a tourer was set on fire, for instance, was set up, yet was presented very realistically. The idea of some features purposely being scripted for laughs seems rather disappointing to any viewer, especially when the show was so spontaneous in earlier editions. It must be commended that the show does have a proven track record of success. No other programme has ever been as commercially successful as Top Gear and probably no other programme will be. The recent 19th series of the programme finished alongside two “Best of Top Gears” – a regular look back the highlights at the end of the series. The stand out feature from this series was the quality of the films. Yes, Top Gear might not film as many reports as previous series’ but the quality of what is produced is above and beyond an ordinary motoring programme. The two-part special featuring the presenters travelling to find the source of the River Nile was possibly the greatest Top Gear adventure yet. The trip felt fresh, alive and exciting. The presenters were genuinely passionate about their quest to find what they had been challenged with. And with the usual combination of bickering, bantering and boyishness, the show was a ratings success for the BBC. Some of the ideas have felt a little strained, almost as if Top Gear executives are running out of ideas. However, if Top Gear are going to do less shows per year, the overall quality of series 19 would be welcomed any day. Yes, Top Gear has been on air, in its current format, for over ten years now. And yes, it does feel that the top of the hill has been reached in terms of its features. I will always be an avid and loyal viewer to Top Gear whatever happens. Lots of people will moan about how the show has moved from its roots to focussing just on fast super cars. My argument is that Top Gear is a reflection of its audience. An audience which has developed and changed with the years. Awarding Jeremy Clarkson a special recognition award in 2007, Sir Trevor McDonald claimed: “He has helped create a niche show for enthusiasts into a must see show for millions of fans.” Not many programmes can boast of that success.